I've been so bad at blogging lately that I haven't done a favourites blog post in so long, so apologies for that, but here's what I've been loving throughout July. I know I'm super late to the party with this one, but I discovered NUXE's Reve de Miel recently and I've been absolutely loving it. For me, it's the perfect consistency for a lip balm and I've never known a product to keep my lips as moisturised as this, I can't recommend it enough. This has definitely been my scent of the month (check out my full review here) I've been using this body butter very generously in the hope of maintaining my holiday tan. As with all The Body Shop body butters, it's very moisturising on the skin without feeling sticky, it sinks into the skin well and helps keep the skin soft all day. Plus this smells INCREDIBLE! Again, this is another one that I've recently reviewed, check out the post here. As I mentioned in that post, I have totally fallen in love with this product. I never thought I'd master the art of contouring and whilst I'm not 100% there, this product is definitely the best I've tried and at such food value for money, you can't fault it. Another one that I'm super late to the party with. I know everyone has been raving over this product for months, but I'd never given it a try before. I bought a travel sized version for my holiday and have loved using it. It's so refreshing on the skin and wipes away make up so easily so you don't feel like you have to scrub it off your face. I liked it so much that I've bought the full sized version to leave at my boyfriends house. I am LOVING chokers this month and have been wearing them pretty much 24/7. I love this one from New Look as I think it's so cute with the little peace sign. I feel like chokers really complete an outfit and can help jazz up pretty boring outfits. I feel like I'm 8 years old again, but I've been loving metallic temporary tattoos recently. I actually bought this pack in Portugal, but you can get them in lots of shops in the UK, such as Topshop and Claire's. They're a bit of fun and something a bit different for the summer. 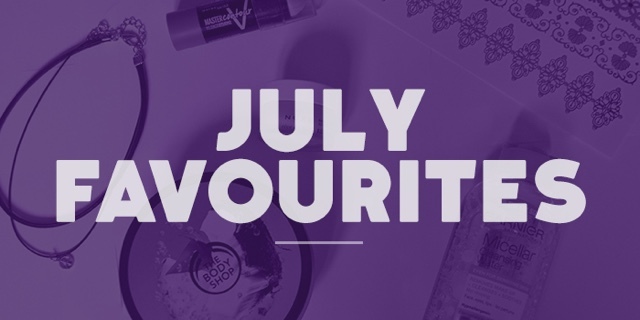 So that's what I've been loving this month, let me know what your favourites are for July.